Architecture in Austin is unique, which is why most Architects look to understand its history. 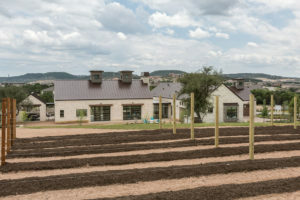 Influenced by local materials such as native white “Austin” limestone and local “Marble Falls” granite, Austin Architects were traditionally influenced to create a vernacular locally referred to as “Hill Country“. It started at the Texas Capital Building, which is faced on the exterior largely in locally-sourced Marble Falls granite. This is what the locals call “pink granite”. It then moved to local white limestone which is today used for most exterior facades in Austin, in both commercial and residential architecture. Today, it is mixed with other stone and brick and even cut in different patterns to update the look. Traditionally, Austin Architects have also been influenced by local culture. Nearby Austin, there are several Germanic small towns like Fredricksburg and New Braunfels. Settled originally by a strong German community, the influence of much of small-town Germany can be clearly seen in their local architecture. Certain techniques have also contributed to the local architecture such as the “German smear”. This is a technique where the mortar is smeared over the top of the limestone to create a cross between stucco and stone appearance. These local towns have influenced Austin architecture as well. This is particularly evident in the farmhouse vernacular which has become so popular lately. The large boxy appearance of the farmhouse architecture closely mimics the Germanic style. Only missing are the local stone on the facade and the years of wear. Also worth noting is the symmetry and clean lines of the Germanic influence on local architecture. Clearly seen in the farmhouse style, this can also be seen in other architectural styles as well. When we understand the history and origins of Austin’s architecture, then and only then, can we create new structures that seem to fit the area. There’s no worse architecture than a structure that clearly does not belong in its surroundings. A good Architect will always start with an understanding of the local architecture, both its origins and history, before designing a home for that area. There are even stories, legends even, about Architects who slept overnight in a tent on a site before designing a home for it. While inspiration does not come solely from a site’s surroundings, it does have a strong influence on it. It is also worth noting that local materials and local architecture go hand in hand. The reason is efficiency. It is both cost-effective and timely to use local resources for constructing local architecture. There is cost savings in shipping, especially when referring to heavy items such as stone and granite. Plus, materials from a local quarry, for instance, are always “in stock”. So that makes them a quick ship item. That can be really important for a product that may take several months to install. A delay in these types of products can cause a delay in the overall project.